I don't understand why such discrepancy. Why are my PO computations not matching? you neglected the 1st order subsystem. you neglected the attenuation $\gamma \neq 1$. 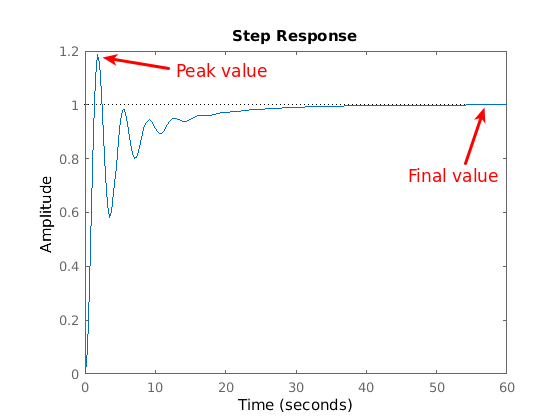 you did not subtract $\gamma$ times the derivative of the step response of $G (s)$ at the peak time. In any case, not neglecting the above would only provide one estimate of the overshoot. To compute a satisfactory approximation of its exact value, you can take the inverse Laplace transform, differentiate and find where the derivative vanishes. Not the answer you're looking for? Browse other questions tagged continuous-signals linear-systems step-response or ask your own question. If low frequency travels longer distance, why our speech is not travelling longer distance? Additive but not homogeneous continuous system? Why is the total signal response response of zero input + zero state, $y(t) = y_0(t) + h(t)\star x(t)$, not an LTI? Which of these features may not be needed or redundant? Why cosine is not an eigen signal? Is this system invertible or not? Initial conditions for systems described in state space - LTI or not?